How do you number the fingers of a bird? This may seem a bizarre question—surely modern bird fingers are unimportant and does it really matter what they are called? All birds, from Archaeopteryx onwards, have three fingers. It is clear in the evolution of theropods, that digits four and five (equivalent to our ring finger and little finger) were reduced and then lost, and that the three digits of Deinonychus and of Archaeopteryx have to be the numbered 1-3. Studies of the embryos of modern birds, however, show that all five fingers are present as cartilage condensations at an early stage of development, but that digits 1 and 5 are lost. So the three fingers of adult modern birds are 2-4. How can there have been a jump from 1-3 to 2-4 in evolution? There is no doubt about the embryological evidence (Burke and Feduccia, 1997): the fourth digit condenses first during early development of the hand and foot in all tetrapods (see Box 4.2), forming the primary axis, and then digit 5 develops posterior to this, and digits 1-3 form the digital arch anterior to the primary axis. In birds, the fifth digit appears in cartilaginous form early in development, but is lost before ossification. It was assumed that bird embryos never had a trace of the cartilaginous precursor of digit 1, but this has now been demonstrated (Larsson and Wagner, 2002). The three digits that ossify are then unequivocally numbers 2-4. This observation has been hailed as clear evidence that birds did not evolve from theropod ancestors (Burke and Feduccia, 1997). Does this evidence overwhelm all the other apparent synapomorphies of theropods and birds (see Box 8.5), as suggested by Feduccia (1999b)? Wagner and Gauthier (1999) have argued that it does not. 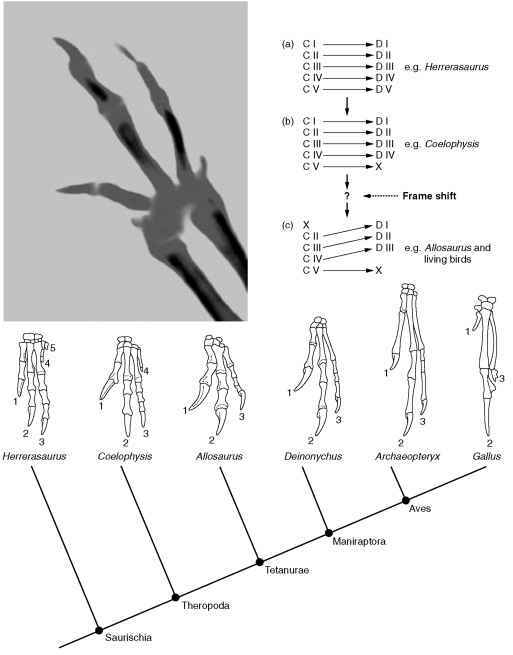 They confirm that the fingers of Archaeopteryx are the theropod digits 1-3, and indeed the numbers of phalanges in each (2, 3, 4 respectively; see illustration) are the numbers seen in the first tetrapods (see Box 4.2). They suggest that Burke and Feduccia (1997) were right to identify the initial cartilaginous condensations as numbers 2-4, but that these ossify as digits 1-3. The early loss of condensation 5 means there is no digit 5, and that is not controversial. They argue then that condensation 1 does not appear because of an embryological constraint: if a tetrapod loses digital condensations from the hand or foot, condensation 5 goes first and then condensation 1 (this is confirmed from embryological studies of modern amphibians, lizards and mammals). But, in the evolution of theropods, ossified digit 5 was lost first (between Herrerasaurus and Coelophysis) and then digit 4 (between Coelo-physisand Allosaurus). Functionally, those two fingers were reduced and lost, but embryologically this could only have been achieved by a developmental 'frameshift' (Wagner and Gauthier, 1999): the cartilaginous precursors of digits 1-4 shifted so that precursor 1 was lost at the same time as the loss of digit 4 and precursors 1-3 ossified as digits 2-4. The frameshift hypothesis has been criticized strongly (Feduccia, 1999b), but it has been confirmed in an unexpected way. Dahn and Fallon (2000) showed, in experiments on bird embryos, that there is no necessary linkage between the numbering of cartilaginous precursors and of digits. The identity of the developing digits is at first unspecified, despite their positions, and digits acquire their ossified characteristics upon interaction with gradients of bone morphogenetic proteins. The timing and pattern of ossification in the limbs are controlled by Hox genes (see Box 4.2), sometimes called homeotic genes, and hence the frameshift hypothesis is based on homeotic transformations, and the new experiments show that such shifts can occur. Read more about this debate at http://www.devbio.com/article.php?ch=16&id=161. Understanding evolution and development: (a) photograph of the hand of a bird embryo, showing the presence of all five digits; (b) the frame-shift hypothesis, in which digits 2-4 are expressed in the adult before the shift and digits 1-3 after; (c) phylogeny of theropods, showing the reduction of hand digits seen in fossils, and the implied frameshift between Archaeopteryx and the modern bird Gallus. [Figure(a) © Alan Feduccia, reproduced with kind permission; (b) based on Wagner and Gauthier (1999); (c) based on various sources.]. There is a great deal of variation in the flight styles of modern birds. A key insight came from comparisons of wing loadings and aspect ratios (Rayner, 1988). Wing loading is a measure of the relative size of the wing, and it is defined as the body weight of the bird divided by the wing area. Generally, of course, larger birds have larger wings and wing area (especially length) increases with body weight (Rayner, 1996). The aspect ratio of a wing is a measure of wing shape, defined as (wingspan)2 divided by wing area. A high aspect ratio indicates narrow wings and a low aspect ratio indicates broad wings. Low wing loadings (i.e. relatively large wings) are associated with lower flight speeds, improved manoeuvrability, improved soaring performance and reduced agility. High aspect ratios are associated with greater aerodynamic efficiency, whereas low aspect ratios (shorter wingspans) facilitate take-off and flight in cluttered environments, such as forests. Birds fall into four categories depending on their wing loadings and aspect ratios (Rayner, 1988), and these correspond to flying styles. 1 Marine soarers and aerial predators (high aspect ratio and low wing loading). These are generally large birds, some of which (albatrosses, tropic birds) remain airborne for long periods, soaring on air currents to save energy, and others, the aerial predators such as swallows, gulls, falcons and kites, require manoeuvrability and endurance. 2 Diving birds (high aspect ratio and high wing loading). These include birds of various sizes, such as gannets, auks, some ducks and grebes, that fly, dive and (sometimes) swim underwater, but do not generally fly in cluttered habitats. Some diving birds, such as penguins, have wings so small that they cannot fly in air. 3 Thermal soarers (low aspect ratio and low wing loading). These include larger owls, flycatchers, herons, hawks, eagles, storks, vultures and the condor, a range of small to large birds. The low wing loading allows the larger birds to soar on thermals and the smaller ones to be manoeuvrable in pursuit of aerial prey, especially in forests. 4 Poor fliers (low aspect ratio, high wing loading). These include turkeys, peacocks, pheasants, cormorants and tinamous, birds that are generally happier on the ground. Their flight performance is poor as their wings seem to be too small for their fat bodies, although they can move about in forests and take off rapidly from the ground. Archaeopteryx has asymmetric flight feathers and wings, so it was clearly a flyer. Ostrom (1976) argued, however, that Archaeopteryx could hardly fly at all because it lacks two bony elements that seem to be essential for flight in modern birds: a keeled sternum for the attachment of the pectoralis and supracoracoideus muscles, and the triosseal foramen between the cora-coid, scapula and humerus. Four lines of evidence have been presented, however, to show that Archaeopteryx was probably a good flyer (Rayner,2001). 1 It has wings formed from a forelimb and feathers that are similar to those of any modern flying bird. 2 The pectoralis muscle could readily have originated from the robust furcula and from the small sternum, and the supracoracoideus muscle is not necessary for the recovery stroke of the wing. Bats, which are good powered fliers, have no keel on the sternum and they also lack the triosseal foramen, although they have large deltoids. 3 Archaeopteryx has asymmetrical vanes on its feathers as in modern flying birds (flightless birds have symmetrical feathers) and the feathers are curved. The asymmetry and the curve are necessary to allow the feathers to adjust aerodynamically to all stages of the wing beat. 4 Reconstructions of the flight muscles of Archaeopteryx suggest that it would have had adequate power for ground-upward takeoff and for sustained flapping flight (Elzanowski, 2002), even though the estimated mass of the pectoralis muscles was lower than in modern flying birds. By comparison with modern birds, Archaeopteryx probably could not have engaged in slow flight, and it was not agile or manoeuvrable in the air. It would have been capable of fast or cruising flight, because this mode requires smaller forces from the pectoralis muscles, the mechanical energy demands are less and the wing-beat geometry is simpler (Rayner, 2001). Taking off and landing would have been a problem, because slow-flying techniques are required. The origin ofbird flight must be entirely speculative. Numerous ideas have been aired, but there are two main current models, the cursorial ('ground up') and arboreal ('trees down') (Figure 9.4). The cursorial hypothesis has been developed from Ostrom's idea that Archaeopteryx was essentially a small running theropod dinosaur that used its feathered wings and tail as a kind of insect-catching system. Caple etal. (1983) presented an aerodynamic model in which the bird ancestors leapt into the air in pursuit of insect prey. Feathers and wings assisted and extended their leaps until eventually true powered flight evolved. It is not clear in this model, however, why flapping would have started in a running animal, whether for insect catching or for assisted leaping (Rayner, 1988). The arboreal hypothesis is based on the older idea that Archaeopteryx could climb trees using the claws on its hands and feet. An ancestor initially leapt between branches and then evolved to be able to leap and parachute between trees, or from the trees to the ground. In the end, gliding flight evolved into powered flapping flight. Archaeopteryx has hand claws that are well adapted for trunk climbing, and Rayner (1988) and others have presented aerodynamic arguments that gliding flight is pre-adapted for the evolution of flapping flight. This may, however, be an unhelpful dichotomy, maintained by the linkage ofthe cursorial and theropod origin models and the arboreal and non-theropod origin models (see Section 9.1.3). Perhaps more important is to accept a transition from a non-flying form to a glider and then to a bird such as Archaeopteryx that uses flapping flight (Rayner, 2001). Gliding can be from tree to tree, or over irregular ground. Rayner (2001) empha sizes that the transition from non-flight to gliding is far more straightforward than from non-flight to flapping, an assumption in many of the current cursorial models, whether the protobird is running along a flat surface (Burgers and Chiappe, 1999) or up an incline (Dial, 2003), and whether it is assisted by a favourable following wind or not. Elzanowski's (2002) 'climbing escape' model takes this a step further. The feathered protobirds presumably foraged on the ground. When threatened by a predator, the protobird could scramble or run up to a perch in a tree or on a rock for safety. It then glided down to the ground, spreading its wing feathers to enlarge the lift surface. Flapping then evolved to extend the length of the flight path to the ground.